StrengthTape is a producer of kinesiology tapes and kits already precut and measured for specific body parts (knees, shoulders, elbows, etc), and touts themselves as the official tape of the Ironman Triathlon series. Like most kinesiology tape, they manufacture therapeutic based tape to help increase support, blood circulation, and applying gentle lifting of the skin across injury areas (tissues, joints, etc) to allow for increase lymphatic and blood circulation, which all can aid in the healing process. After hearing about their fairly inexpensive, longer lasting (7 days), and adhesive tape, I was eager to see if this tape actually stacked up to its claims after receiving a roll. 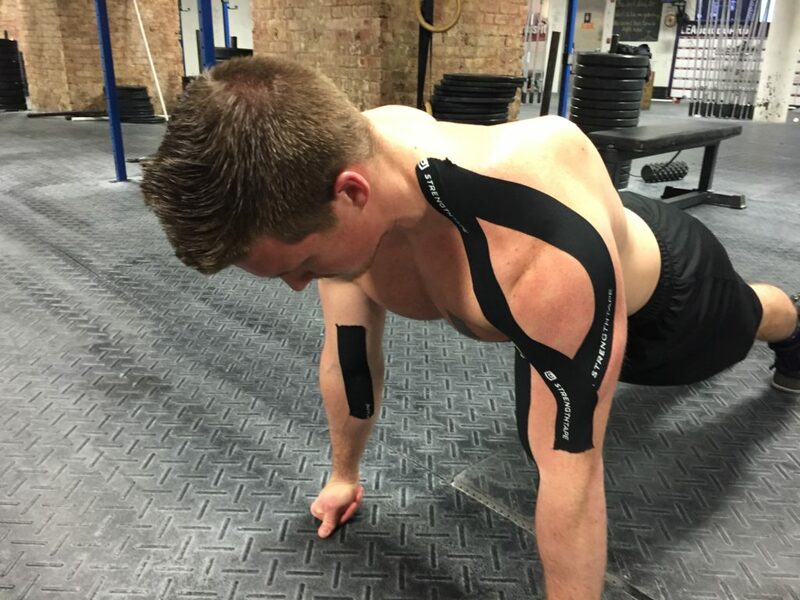 In this article we are reviewing StrengthTape kinesiology tape. Click HERE to shop StrengthTape. I found this tape to offer good adhesiveness and support, as it was able to get immediate feedback while wearing the tape on the trap and upper back and arm. The tape itself stayed in place and allowed for full range of motion, however it lacked rigidity that I would expect from a higher adhesives performing tape. This lack of rigidity, paired with the overly soft feel led me to question the overall support of this tape. I did not, however, have any issues performing Olympic lifts and bodyweight/gymnastics with the tape on, so from that standpoint I am overall happy with the experience. This tape was a balanced tape that allowed for full range of motion lifts, explosive movements, and still provided good feedback and support. Athletes looking to experiment with a balance tape (not too rigid yet still supportive) may find this tape to be a good option. Athletes looking for either end of the spectrum may find better luck with other kinesiology tapes we reviewed here. The tape comes in both pre-cut and uncut versions, as well as pre-made kits specifically for a body part/injury. I found the non-cut roll to be easy to tear, and very easy to apply, especially with the online resource applications guide. The tape itself was smooth and adhesive, making a very good companion for most lifting and athletic sessions. It is important to note that lifters who may have sweatier skin and/or have high degrees of body hair may want to opt for another more adhesive and less absorbent (this is completely based on my opinion, but the material felt more absorbent than others). StrengthTape is made up of a stretchable cotton and spandex, which was both soft and easy to move in. The material itself felt comfortable, however I wondered if the tape would be overly absorbent in sweatier conditions. For lifters and athletes in wet/ sweaty climates, this may be something to think about. I found this tape to adhere well, despite my concerns about the potential absorption of sweat abilities of this tape, which I feel could limit the adhesiveness. The tape itself was firm, yet tore very easily (which was a plus about the application process), however made me wonder if it would lose the stretch. StrengthTape did state that their tape lasts up to 7 days, which is quite long for most cotton versions, though I’m not sure how true that would be. I do feel that there are much more durable options, though this is a well balanced roll that doesn’t break the bank if bought in larger quantities (see pricing). 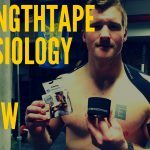 StrengthTape sells (on their website) both 5m and 35m ($19.95 and $99.95, respectively) long tape rolls, as well as pre-made tape kits that can be purchased for varying body parts for $8.95. The tape itself is more on the pricey side as compared to it’s competitors, however for those looking to buy in bulk, this may not be a bad option since the price per roll comes down to slightly lower than the average. I did find cheaper prices of the tape on Amazon and at Walmart, so those are some things to keep in mind. 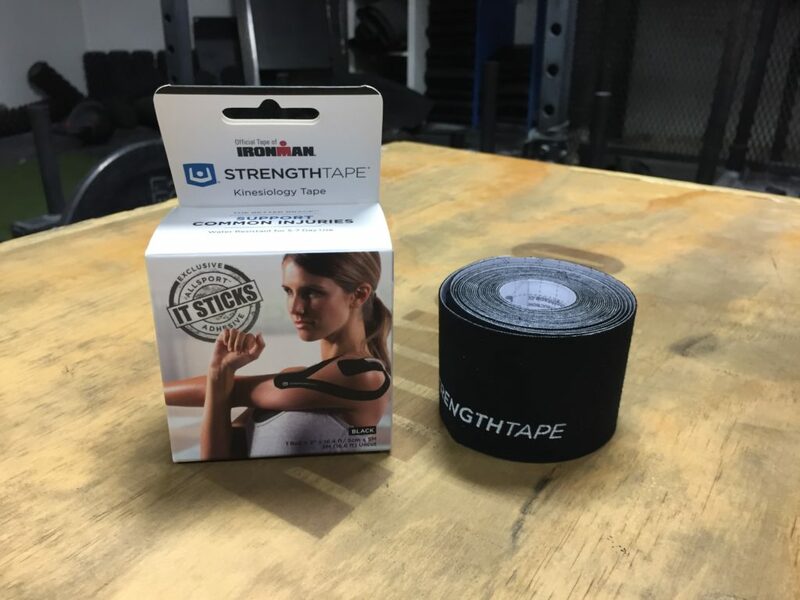 I found the StrengthTape kinesiology tape to be a solid cotton-spandex tape option for most individuals, however those looking for bulk orders may find better pricing buying in bulk StrengthTape. 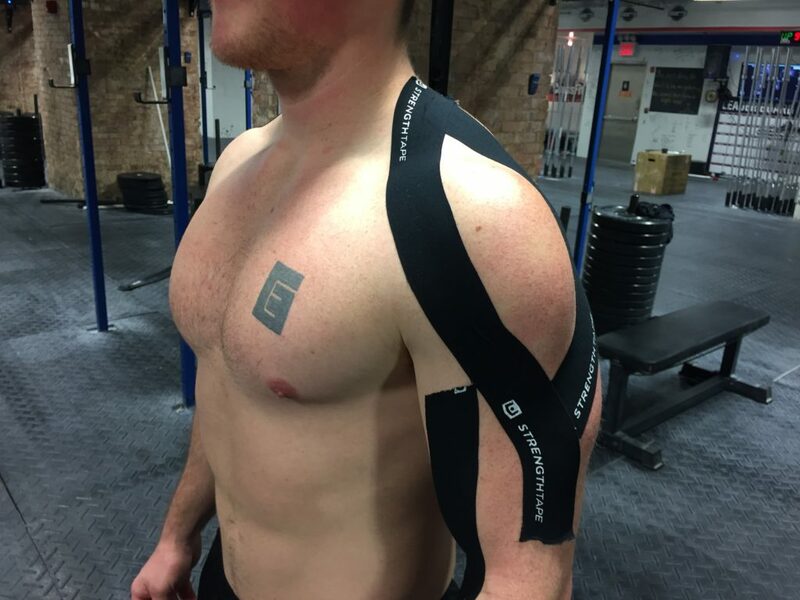 Overall, the tape was a nice balance between support and function as it did adhere well and stay put during intense WODs and full range of motion movement. Lifters and athletes looking for a middle of the road, no overly pricing roll, my find this to be a good option to address their needs.